Celebrate the season with your gardening colleagues at this gala event where flower show winners are honoured with beautiful trophies, special contributions to the society are recognized, and door prizes donated by members and local businesses are available to be won. Doors to our room at the Richmond Hill Country Club open at 5:15 pm and dinner will be served at 6:15 pm. 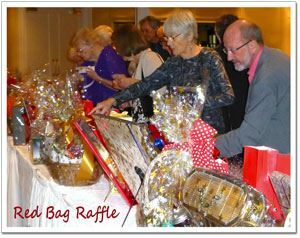 Come early for socializing and to maximize time visiting the Red Bag Raffle offerings. Tickets are available by clicking the "Register" button. Tickets purchased online can be picked up at an upcoming General Meeting or at the Reception table on the evening of our event. Tickets for members and guests (1 guest per member) are $55 each. Non-members are welcome to attend ($60 each).